I had been waiting about six months for the chance to access Ausewell Woods. Forestry works and birds nesting meant the woods were out of bounds for the summer, but now I had the chance to explore. The weather forecast wasn't ideal. We had the prospect of a few showers, some heavy ones arriving later in the day. 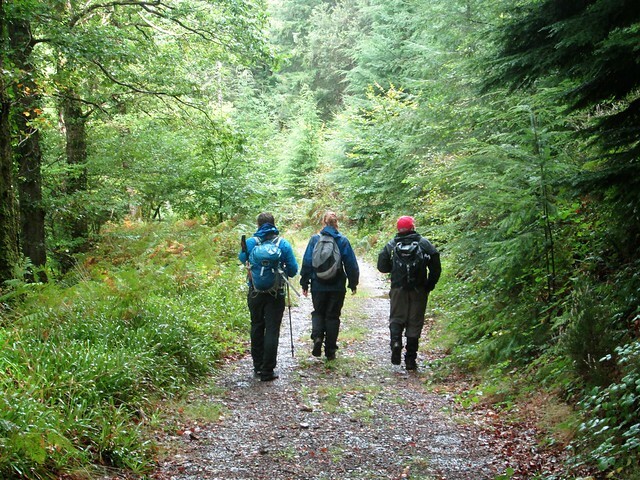 Despite this, we all met up at the south- east entrance to the woods; we being Richard Flint, Tim Jenkinson, Kerry Pearn and I.
Pre-walk faff complete, we took the mud track in, at first heavily churned up by the forestry machinery, but soon becoming easier. We followed this on a right bend to west of Ausewell Rocks, at the summit of the hill. 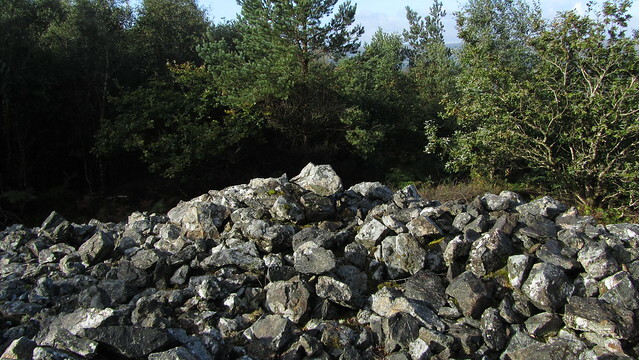 We couldn't see the outcrops, but a narrow path appeared to head in the right direction, passing one of the two mighty cairns constructed nearby. The path then proceeded to take us around the rocks, still out of sight, until we had to venture into the bush to find them. It wasn't long before we could see them, but getting close is difficult underfoot. 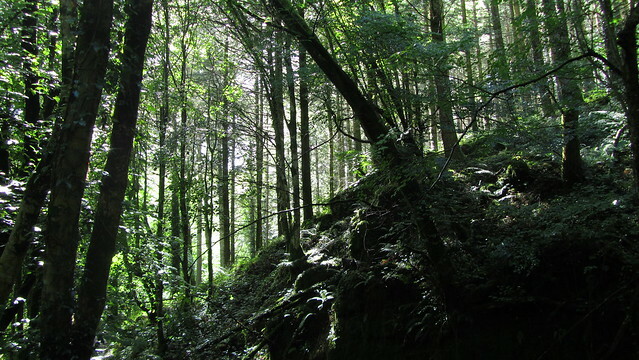 The area is littered with clitter hidden beneath vegetation and each step is perilous. 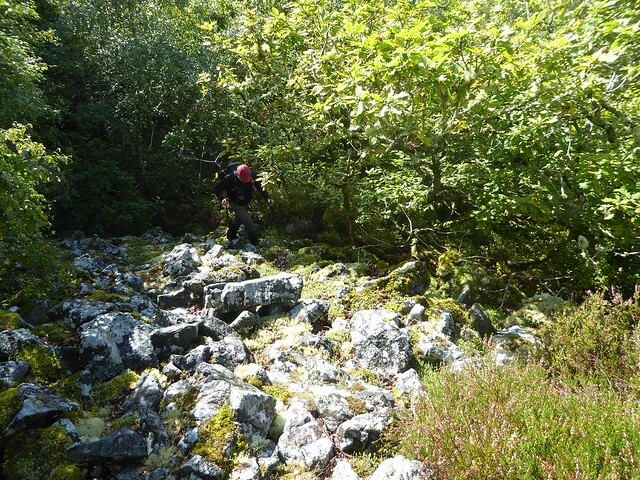 Kerry and I led the way towards the eastern back of the middle outcrop, climbing up and over the edge to reach the western side. 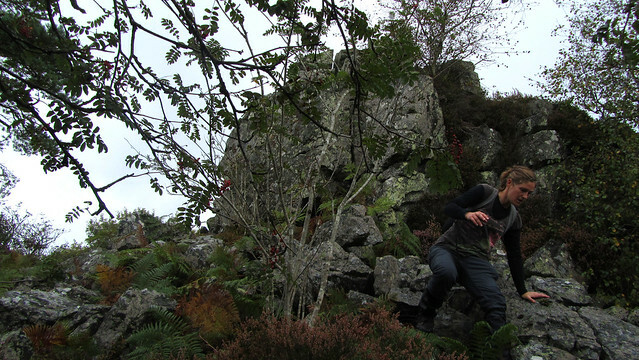 It soon became clear that Kerry was as nimble on the rocks as a mountain goat, finding a way up to the summit of Ausewell Rocks, aka Hazel Tor. 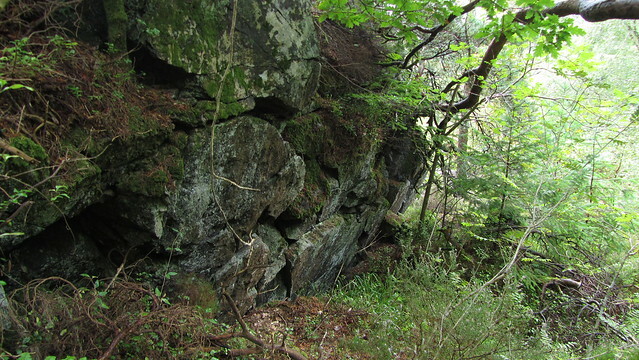 It was a similar bushwhack to the eastern outcrop. This one has a touch more gnarly character than the middle, but was much smaller. 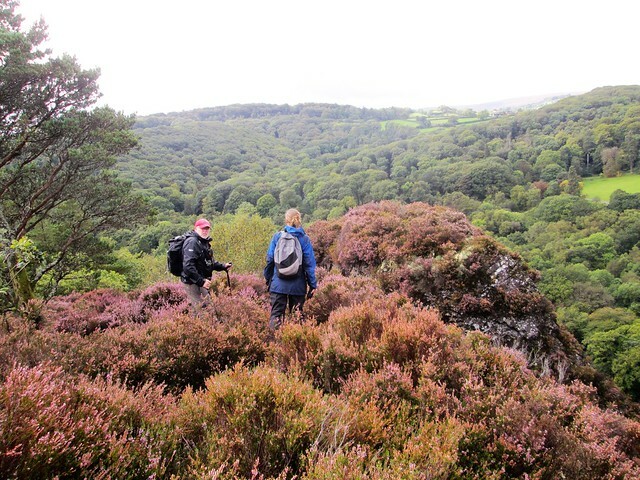 Getting to the western section was just as tough, along with the clitter, this is really difficult walking through high bracken at this time year. 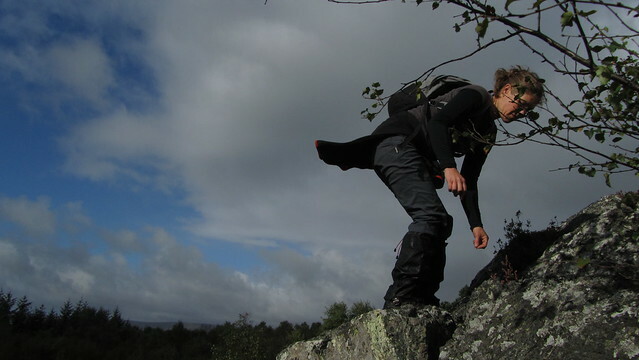 Once again, Kerry made it to the top, where she could see the first shower approaching. 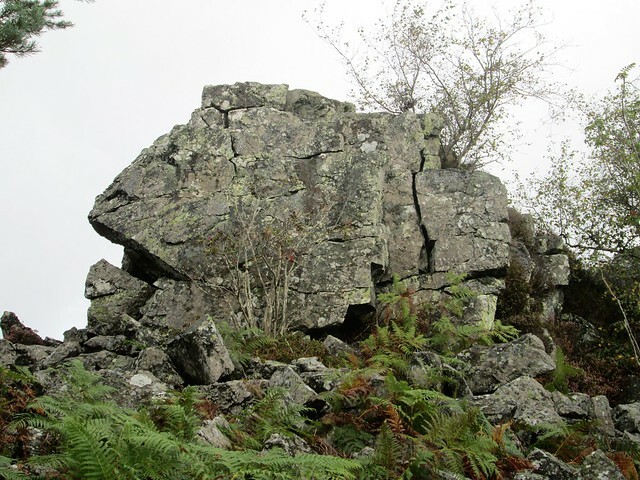 One of the outcrops is known as Lion Rock; although we can't be certain, we think it is the west pile, as this photo taken by Tim suggests the open mouth of a lion. We had to work out a way back to a track, and the map showed a westerly direction promised some respite from the rutted woodland floor. 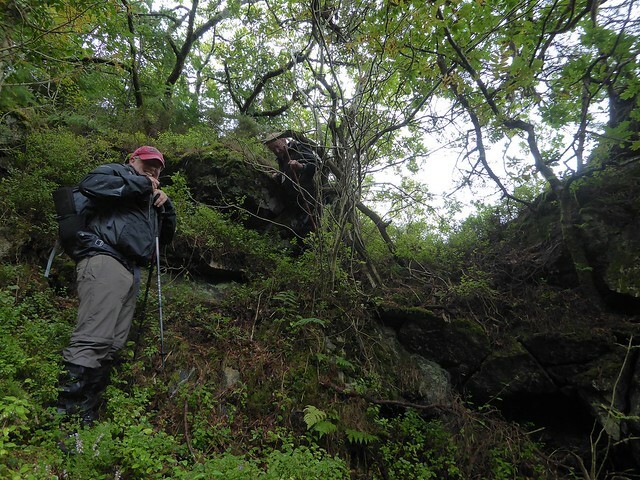 We found ourselves back at the track we came in on which was little use and so we continued west down the hill, attention piqued when noticing a large outcrop on the map, above the nearest track. 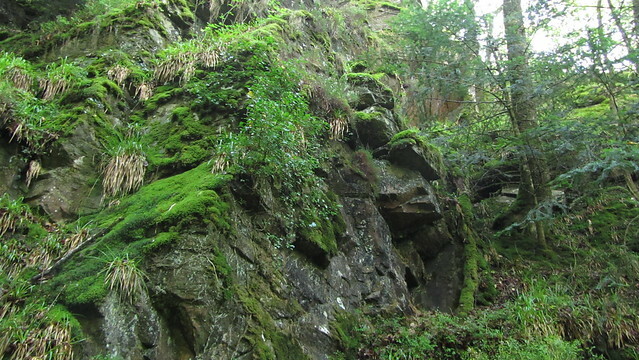 It wasn't Raven Rock, too far east and at a higher altitude. Later research unearthed a 1605 map of Ashburton, which shows a collection of outcrops running west, from Ausewell Rocks, down the side of the hill, to the Dart, of which Raven Rock below was a member. 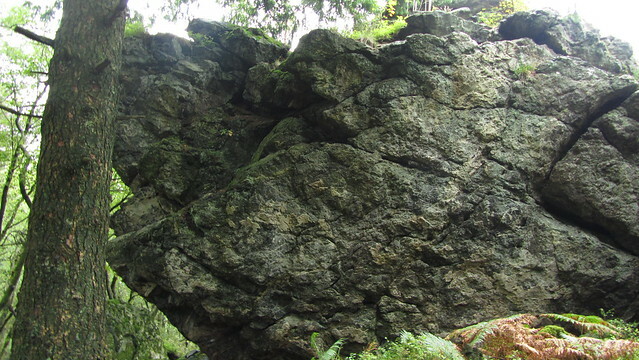 This formation was called Hepstock Rocks. At first, it showed little in height, but intent on a better look, I took us right, around the northern edge. 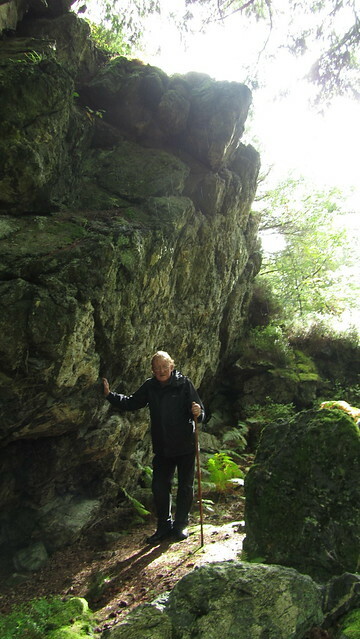 Stepping down the steep clitter strewn hillside and then along the bottom of the rocks, the size of Hepstock Rocks was revealed, proving to be as impressive as Hazel Tor above. It was tricky to get close to these giants, but eventually Kerry led the way up to a narrow ledge on which we all managed to squeeze between the branches. 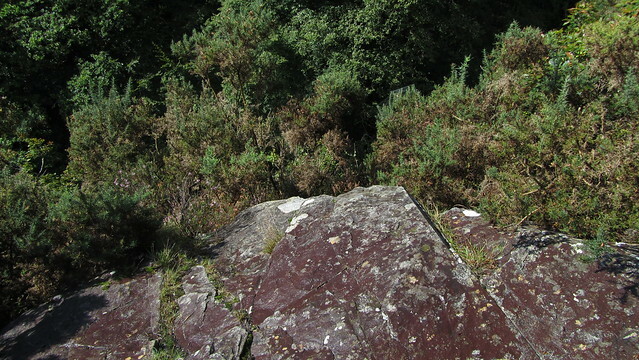 Here, we could see a high cliff dropping the other side. 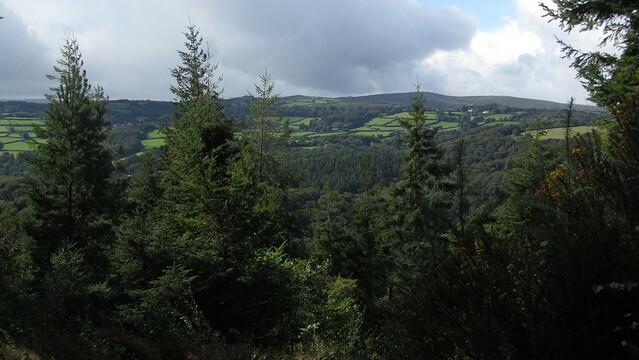 We shuffled around so we could all manage a view, before returning to the woodland floor. Further descent, to one of the old driveways that contour the hill, following it south a short way to a gate and wall at the edge of the woods. We turned here, back into the trees, dropping a a couple of contour lines to another drive below. 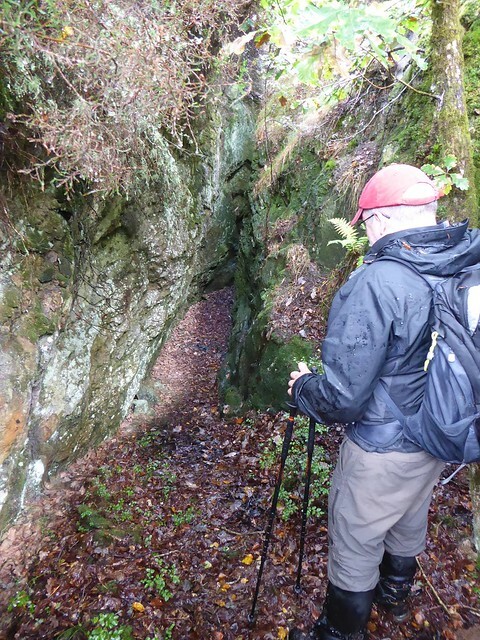 We went across the track, south-west towards the beginnings of evidence of the old Hazel Mine; some walls and a barbed wire fence. 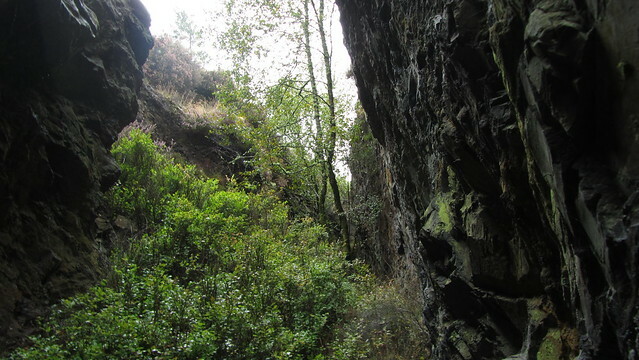 Reaching the next wide track, it was a short distance to the rising mound of Cleft Rock. We stepped over the fallen barbed wire and ascended, passing adits and deep gullies, to the heather covered purple summit where we were met by sunshine and a wonderful view! 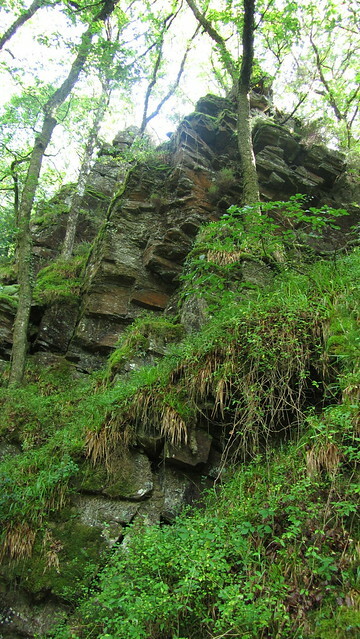 It is believed that the old iron and copper mine at Cleft Rock began in the early 1600's, but the 1605 map of Ashburton did not mention either the workings or the outcrop so we can surmise it did not exist yet. 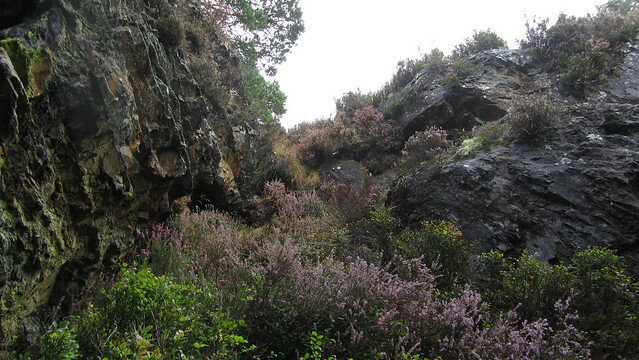 The heather upon the summit made it dangerous to approach the cleft, which is a deep gunnis that splits the rock; open cast workings to extract the shallow lode of copper running through it. It had various names throughout its lifetime; Ausewell, Hazel Copper Mine, East Wheal Hazel and the Wheal Hazel Mining Company. It finally closed in 1860. We started to move on, whilst impressed by the vista, somewhat disappointed by the view we had of the rock. 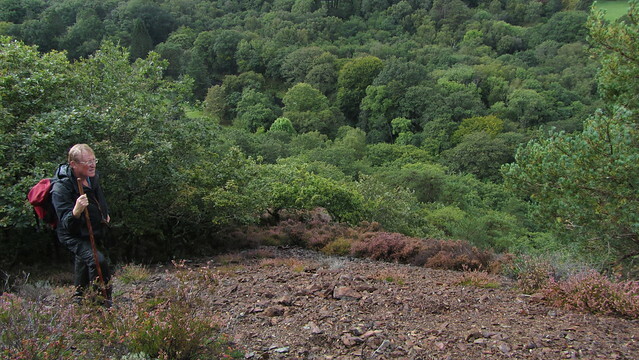 Before descending, we went for another vantage point, around the rock, and came out on an exposed spoil heap for the mine. 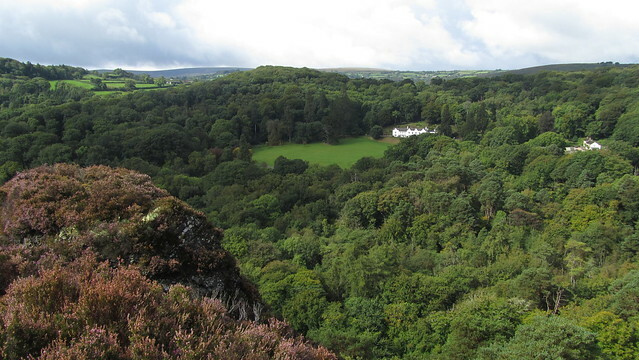 Again with great views of the Dart valley and beyond but little view of the outcrop. As we left the heap, I spotted, half hidden behind the trees and bushes, what I assumed was an adit. Curiosity got the best of me and I diverted to see how far it went. 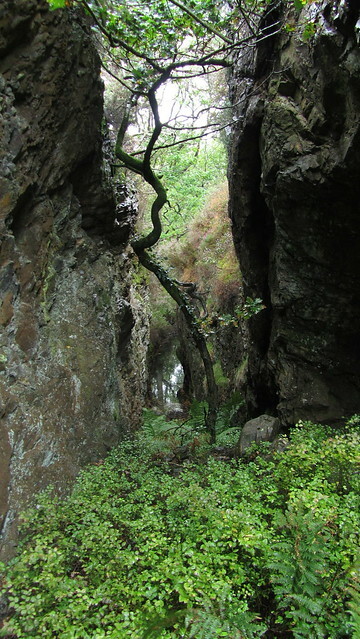 Pushing passed the branches, I stepped into a fissure; I had stumbled upon the gunnis! It was narrow and the route, carpeted by windswept leaves, curved right. 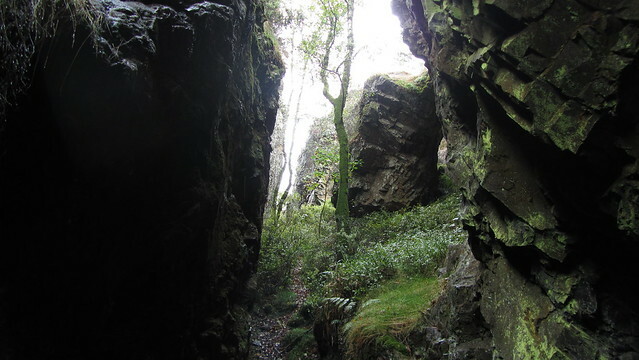 I called the others to follow, and stepped round the corner into the epicentre of the rock. 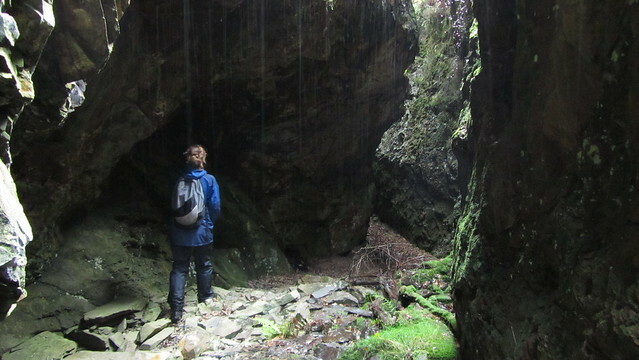 The walls towered, a dark and foreboding place, yet we found a sleeping bag under an overhang and a discarded camouflage jacket amongst the leaves on the floor; had the owner left it, or had they ever left? It reminded me of a gruesome discovery back in 2010, when a skeleton was found in a sleeping bag elsewhere in the woods. Further in, where the fissure widened and light entered, nature had taken hold. It appeared we may be able to walk its length but the last remaining section was waterlogged. 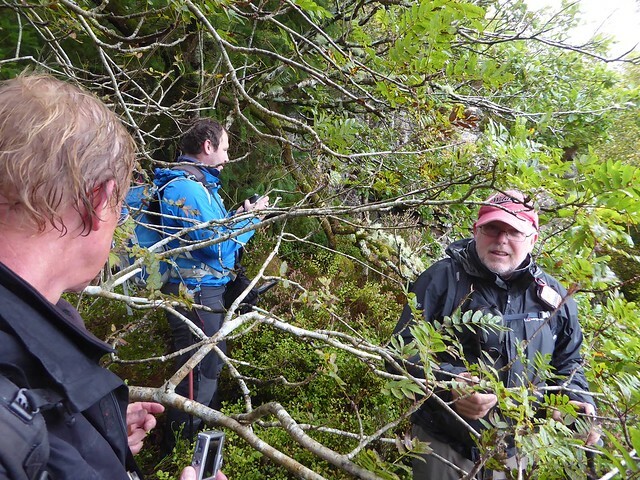 We were all buzzing from this unexpected find and continued with renewed enthusiasm, down to the Double Dart below. This was on another of the good driveways that haven't been lost or destroyed by Forestry vehicles. 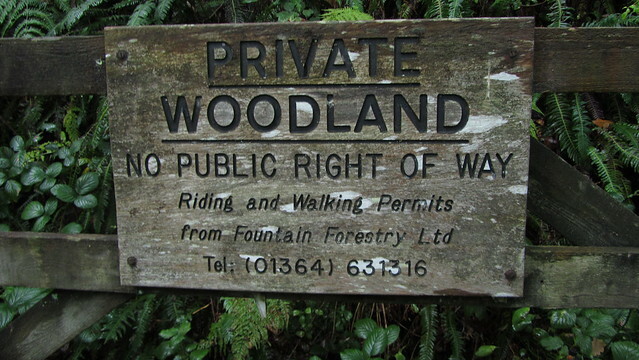 We passed out of Ausewell Woods, a sign on a gate giving contact details for riding and walking permits to Buckland Woods. We wrongly thought this also applied to Ausewell, but I was later to find out that it did not. So we were indeed privileged to be here. 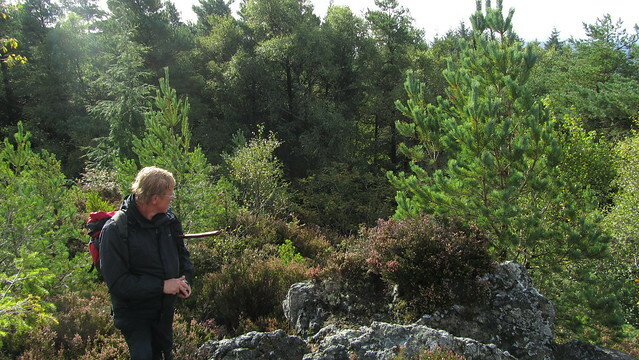 We were heading for Lover's Leap, a high rockface on the edge of the Double Dart that Tim, Richard and I had seen from the opposite bank when we had explored Holne Chase. 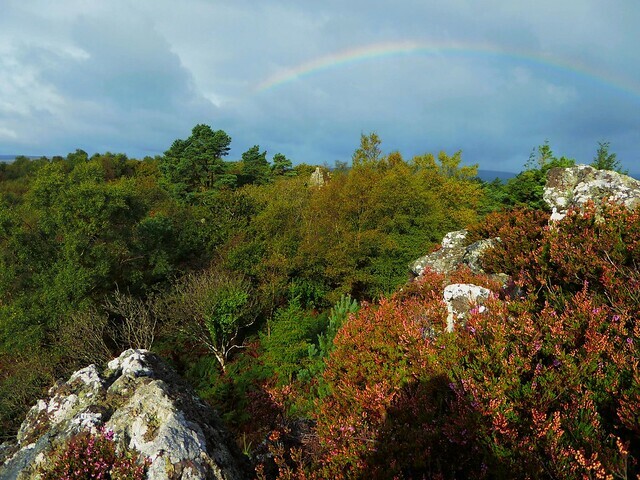 Of course, the name suggest a suicide and Legendary Dartmoor tells the legend on his website HERE. From this side, the experience of Lover's Leap is disappointing; a slippery ledge above the water, with little indication of its beauty, it is clearly better viewed from the other side. 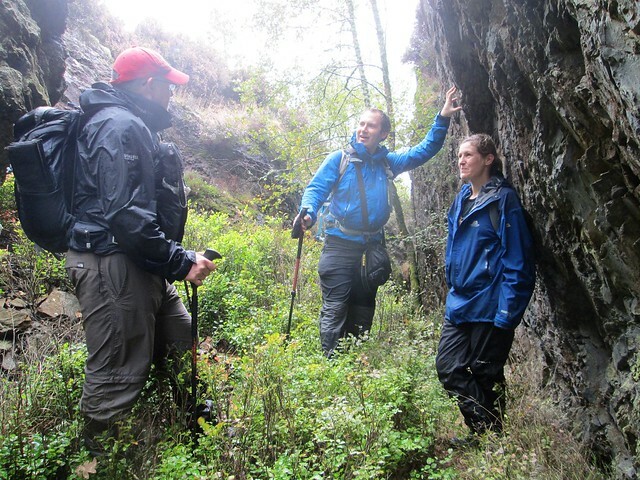 But, what you do discover from here is the towering cliffs that stand behind it. 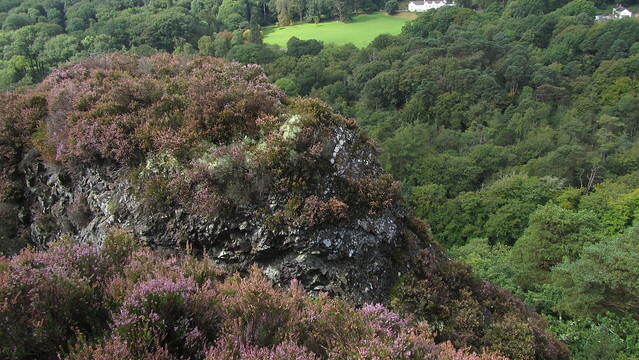 This is Launceston Tor, or to give it it's correct name, thanks to the 1605 map of Ashburton, "Landscore Tor". 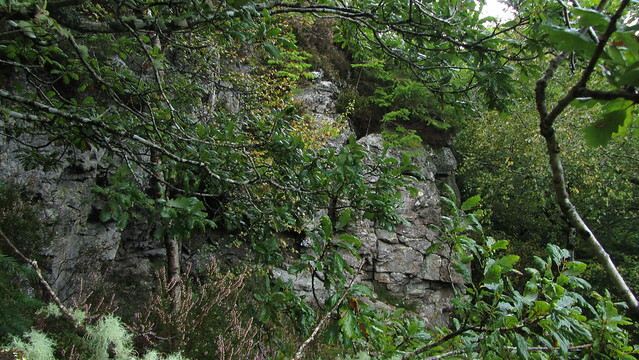 The rocks rise so abruptly, it cricks your neck to look to the top! 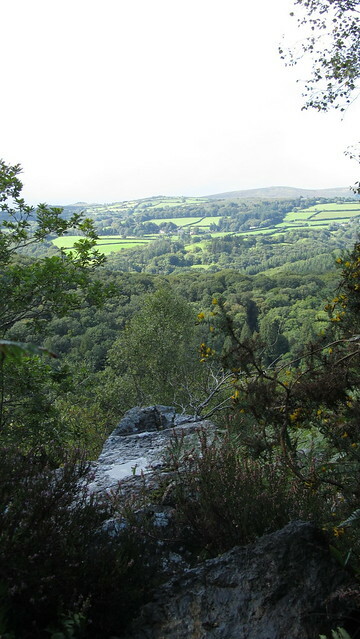 Googling the term "landscore" I came across another page on the excellent Legendary Dartmoor site about the Peadington Landscore, essentially an Anglo-Saxon Boundary of which a part was reputed to run along this stretch of the river. 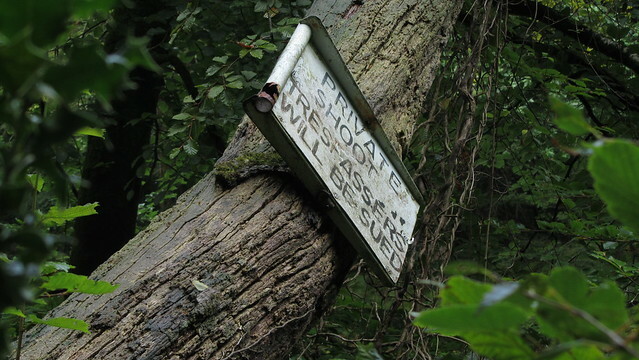 This could be the reason this tor is named as such, but it is also along the Parish Boundaries of Buckland and Ashburton. 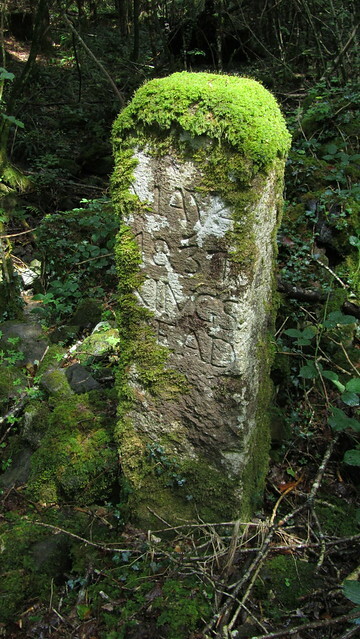 On the driveway, beside an overgrown brook, there is also a marker known as "The Lover's Leap Boundary Stone". 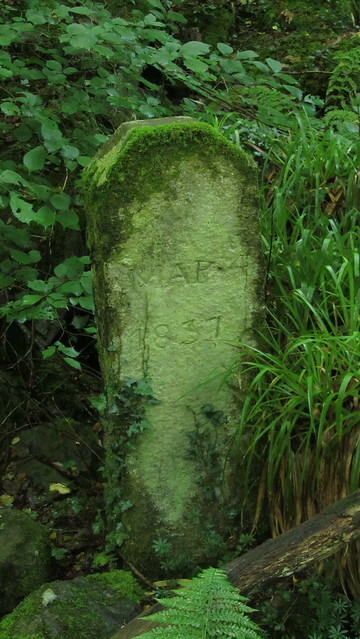 The inscription on the front of the stone is "May 4, 1837", although somebody has defaced it and it appears to now say "Mar". 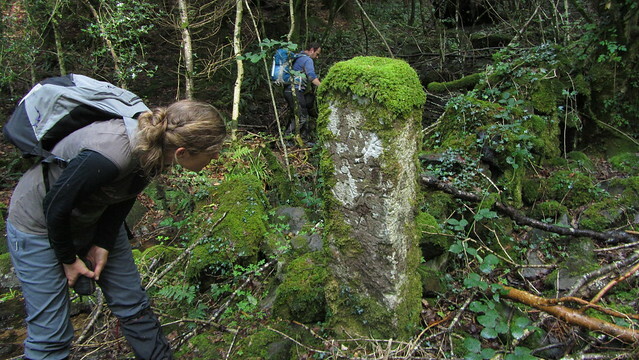 This boundary stone is one of two not often seen, the other being further up the hill, and one we were to go looking for next. Heading straight up the brook looked impossible, so we continued on the driveway to the edge of Ausewell Woods, where it switched back to head back within the estate. The plan now, was to pick up an old path, still marked on the map, but in reality it has been lost in time. What entailed was a trek through a plantation, a dark and foreboding route thankfully aided by hand-railing a nicely placed wall. It took us to the brook we had seen below, now just a waterlogged re-entrant, where we found the other Boundary Stone. It possesses the same date as the one below, a clearer marking that confirms the one below had been tampered with. 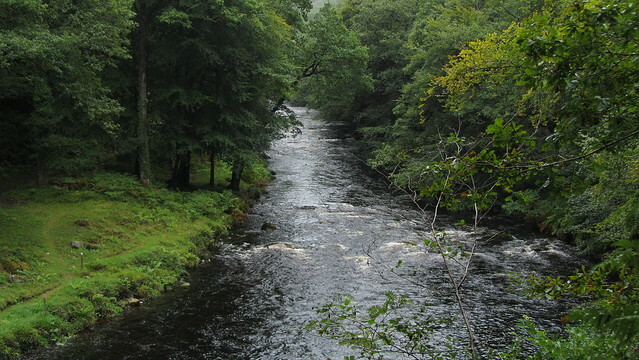 It also has the name "Kings Head" upon it, reference to the woodland it resides, and possibly the name of the brook, albeit too grand for the sorry state of it. 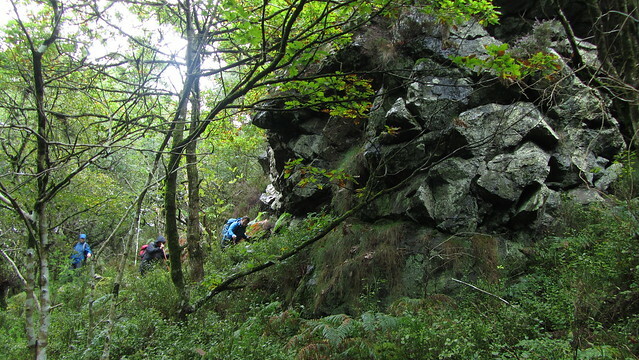 We climbed out of the re-entrant, thankfully there was a good track close by and worth knowing if I ever visit the boundary stone again (which I no doubt will!). 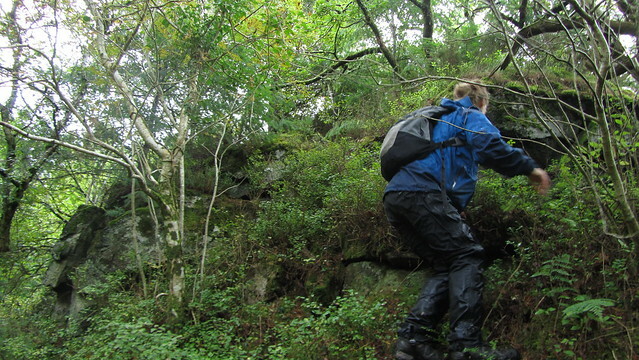 To get to Raven Rock, our last bag of the day, I was looking for another marked track. For part way, we had found it. Although it contoured the hill on the desired height, it was overgrown, neglected and eventually it was indistinguishable from the bush. I decided the best option was to get to the good track I knew existed above. 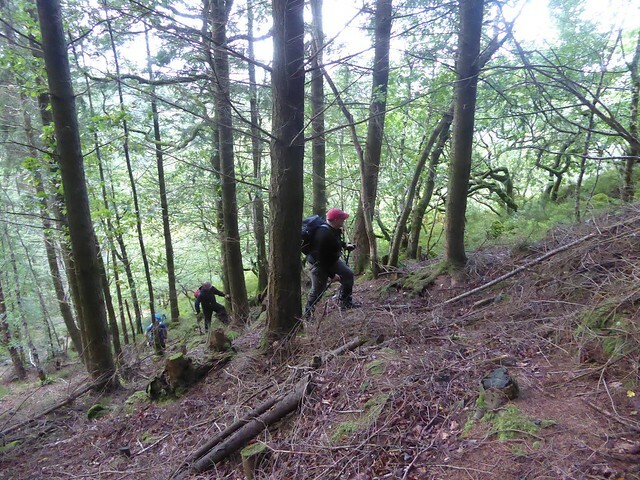 This meant a steep climb up a slippery woodland floor that was a relief to finish. We took a break, this was becoming an exhausting day. The track south reached a branch off right, which I knew would take us below Raven Rock, so once again, we found ourselves descending the hill, with the knowledge that eventually we would be scaling it again! 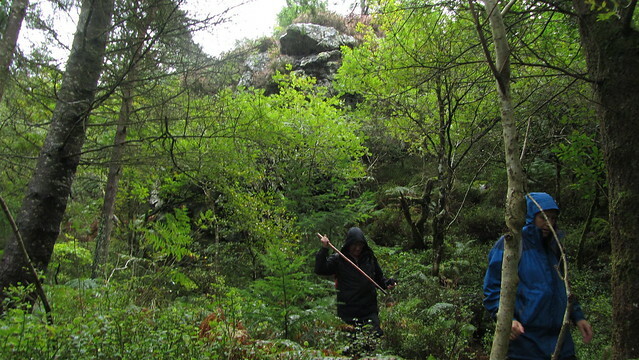 We had reached the other end of that marked track that had been lost earlier, but this was easy to follow, taking us to the bottom of Raven Rock. The view of the rock in winter, when I was last here, was rubbish, so with all the summer foliage, it wasn't going to be better. But I hoped we could get closer and ascend to the top, beside it. 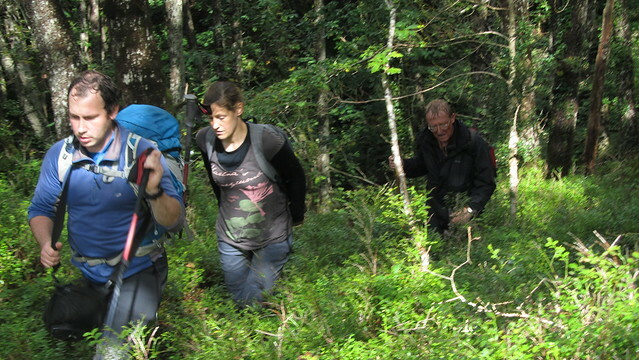 We found a way up through the trees, Kerry leading the way, but getting a good photograph wasn't possible. Before we knew it, we were on the scree that makes up the upper section, with little view of the rock itself. I think the photo I managed last January was no better than the one I was taking in September. Ironically, it was at the very top, on a track, that I got the picture of the view from the summit. All that wasted effort, but you never know if you don't look. 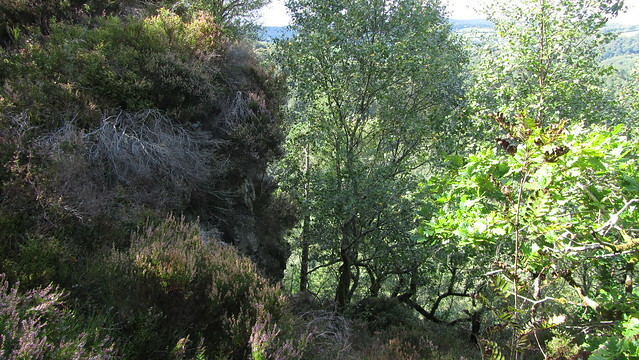 Now we had the remaining ascent out along tracks to the north-east exit of the woods. One last chance of a view, we then began our climb. Reaching the woodland gate, we joined the road and walked back to the cars at the other entrance. Tired but thoroughly pleased with an enthralling walk that I can't wait to do again. I'll likely make a couple of slight modifications to avoid those non-existent paths, though!